Loaded symbol: an Ethiopian amulet necklace fills the window at Woolworth's. A recent journey to the Horn of Africa provided Tacoma artist Diane Hansen the inspiration “to create a monumental sampling of Ethiopian artifacts” that would stimulate viewers “on a primal level.” The result is Ethiopia Revisited, a new Spaceworks installation at the Woolworth Building featuring Hansen’s epic interpretation of the traditional African jewels she encountered in her travels. Hansen, a noted glass artist, integrated a variety of different techniques to create two window-size necklaces that suggest both feminine power and a spiritual centering. Hansen says that the trip upturned her preconceptions of Ethiopia as an arid, desert-like land; instead she discovered a dramatic landscape of volcanoes, canyons, lushly vegetated rivers and waterfalls, populated by herds of African wildlife including elephants, warthogs and hyenas. It was also “filled with medieval castles, paintings and silver, along with intense agriculture.” Hansen was enthralled by the country’s history and culture, including its ancient tradition of Christianity. The Coptic cross is worn about the necks of Ethiopian men and women. 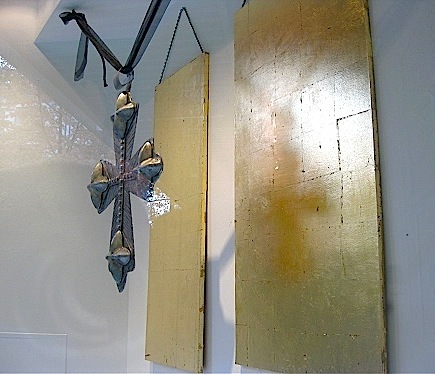 The specific inspiration for her sculptural pieces is drawn from relics of everyday life: “All of the Ethiopian Orthodox people wore silver Coptic crosses around their necks, and always on black cords.” A 15-year-old Ethiopian student showed Hansen her cross, and explained that the black cord was essential. The other necklace, she explains, is based on an amulet-style neckpiece worn for protection and good luck: “A prayer scroll is inserted inside the center tube, and then sealed shut for protection. You never open the necklace.” The amulet piece in silver is worn by women; the Coptic cross is worn by both sexes. ‘Artist Diane Hansen the inspiration “to create a monumental sampling of Ethiopian artifacts” that would stimulate viewers “on a primal level.” ‘ – What does this mean??? In my travels in Ethiopia, I found that so much of what I encountered seemed familiar, yet so extraordinarily fresh and new. I felt connected to the culture in a way I couldn’t explain. The artifacts were fresh, innocent, mysterious and accessible. I use the term ‘primal level’ to express those feelings.